On March 23, 2018, Penn Foundation hosted its 13th annual Legislative Luncheon. This event provides an opportunity for local legislators to visit Penn Foundation’s campus and learn more about the agency’s programs and services and to share their legislative priorities. In a time when mental health and substance abuse are being discussed on a national level, Penn Foundation is grateful for the opportunity to dialogue with area legislators about its programs and the issues facing community behavioral healthcare providers. 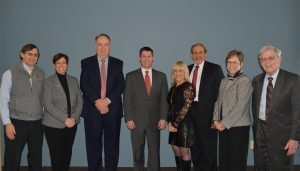 Special thanks to those legislators who attended the luncheon – Bucks County Commissioners Diane Ellis-Marseglia and Robert Loughery and State Representative Marcy Toepel.